In early August I returned from a very enjoyable trip to the Royal New Zealand College of GPs (RNZCGP) who invited me to their annual conference (see photo below) and on the way home I also visited our colleagues in Singapore. This is the third time I have been to New Zealand (NZ) and the second time to the RNZCGP (thanks!). I was struck by the major developments in ‘upscaling’ of general practice there over the last five years. Much of the country now has GPs linked into primary health organisations, with some direct funding for their activities in planning and developing services. I saw the same in my visit to Singapore, and indeed am seeing parallel developments - though less mature – in the UK. I debate these models further in my policy bite this month. A key theme at the NZ conference was ‘Quality’ and how to achieve it. The RNZCGP have had a practice accreditation system for a number of years; this is currently being reviewed, in order to balance the goal of robust measures of achievement with an efficient process of assessment. Many family doctors want a benchmark of standards achieved, and recognition for their work – it is for this reason that WONCA itself is now running options for practice accreditation and academic accreditation, which may be of interest to those who do not have this opportunity at a national level. The NZ debate centred around how to motivate primary care teams towards continuing improvements and innovation, while ensuring that all patients receive a good enough package of care – so setting the ‘bottom line’ but encouraging movement upwards from it ! There is always a risk that some patients will get wonderful care while others get poor care – so checks for both are needed. How our member organizations lead on these issues will vary, but the RNZCGP has a lot of experience to share. You can see my keynotes for this trip on the WONCA website. I was also impressed by the work being done to improve the health and care of New Zealand’s indigenous communities – Maori and Pacific Islanders. 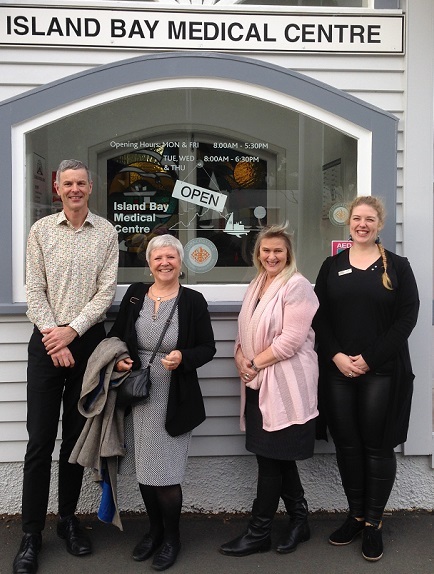 The RNZCGP have staff leading on these issues, and there were traditional welcomes for both meetings. The number of GPs from these backgrounds is low, but numbers are increasing both at medical school and in graduate training. WONCA ha s active leaders in a number of our Working Parties (WPs) and Special Interest Groups (SIGs) – including Prof Felicity Goodyear-Smith leading the WP on Research WP, Dr Tane Taylor convenor of the WP on Indigenous and Minority Health, and Dr Jo Scott-Jones WP on Rural Practice Executive: it was great to see all of them. In Singapore, I was a guest of the Duke National University of Singapore, and met members of our member organization, the College of Family Physicians of Singapore, there as well. I did a Faculty seminar on teaching, and contributed to a medical student workshop about family medicine and research, as well as visiting the College of Family Physicians and one of the Singhealth polyclinics (see photos and talks). Singapore also has strong development of large scale primary healthcare organisations, but GPs are less dominant in these than NZ – however, the voice of family medicine is definitely growing, including having a family doctor in a leading position in their ministry. There is a significant divide between the public and private sector GPs, and speciality postgraduate training is not a mandatory requirement in Singapore. These are both issues that the academic community and professional leadership are actively addressing. The academic community are also busy developing primary care research networks, which are enabling practitioner engagement in research and also facilitating community based research projects. So in summary, the issues for NZ and Singapore mirror many around the world – still a need to get more people into speciality training and into the workforce, especially to serve rural and vulnerable communities; a need for stable resourcing and support, and also for visibility and influence. But the family doctors of both countries are definitely striving for excellence, and it was a privilege to see their work up close. My thanks to all involved. The rest of the work for WONCA has been a continuing stream of activities from WHO, around the Alma Ata 40th anniversary, and preparation for our World conference in Seoul. I have trips coming up to the Towards Unity for Health conference and with whom we are in official collaboration), to Indonesia as a keynote speaker for an International Public Health conference and to meet our leaders there; then to the World Psychiatric Association conference, in Mexico, at the end of September, which will be my final keynote as President to an external partner! I will update you about all this in October, as well as saying a kind of farewell. Till then, all best wishes for your work as family doctors, and your lives as people. Go well and thanks. The RNZCGP will host the WONCA Asia Pacific region conference in 2020 – from 26-31 May in Auckland.